The best solar panel kits offer an inexpensive way to get your feet wet with solar power. Whether for your home, shed, cabin, RV, or camper, solar panel kits are an easy, cost-effective way to go solar, especially if it’s your first time entering the world of solar power. 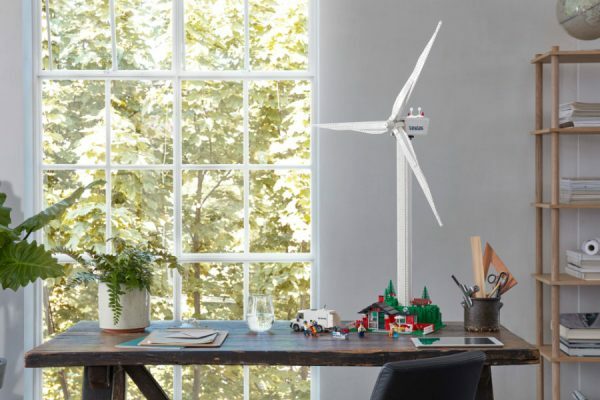 Let’s look at some of the best solar panel kits available in 2019, starting with the smallest and working up to the massive. No matter what your needs, there’s a kit out there for you! If you’re wondering whether installing your own solar panel kit is a good idea, scroll down to the end for info on kit costs, equipment, and how to decide whether a DIY solar kit is right for you. 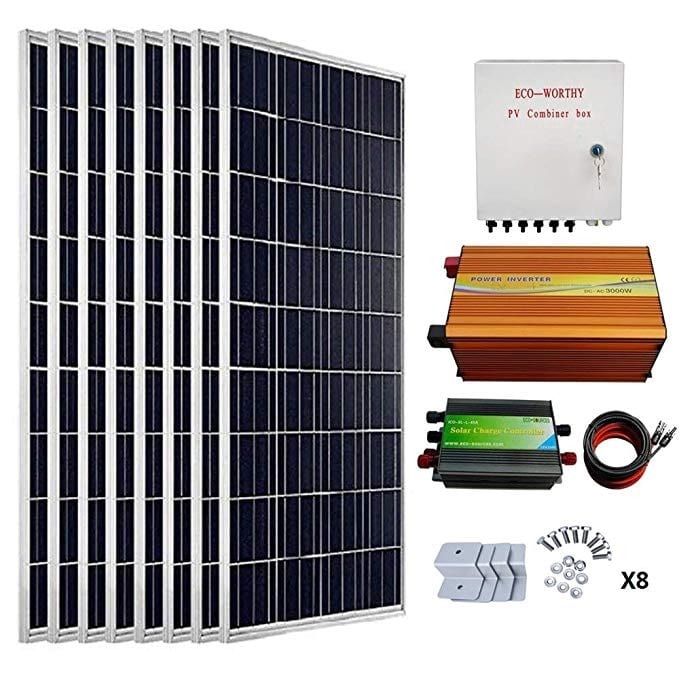 Solar panel kits come in all sizes, from tiny 80 watt folding solar panels for a weekend getaway in the mountains, all the way up to 10,000 watt systems permanently bolted to the roof of your home. With so many different sizes available, we’ve decided to break down our list of best solar panel kits into four categories, starting with the smallest kits for camper vans, then moving to medium sized kits for RVs and sheds, and ending with the largest kits for homes. Let’s get started. 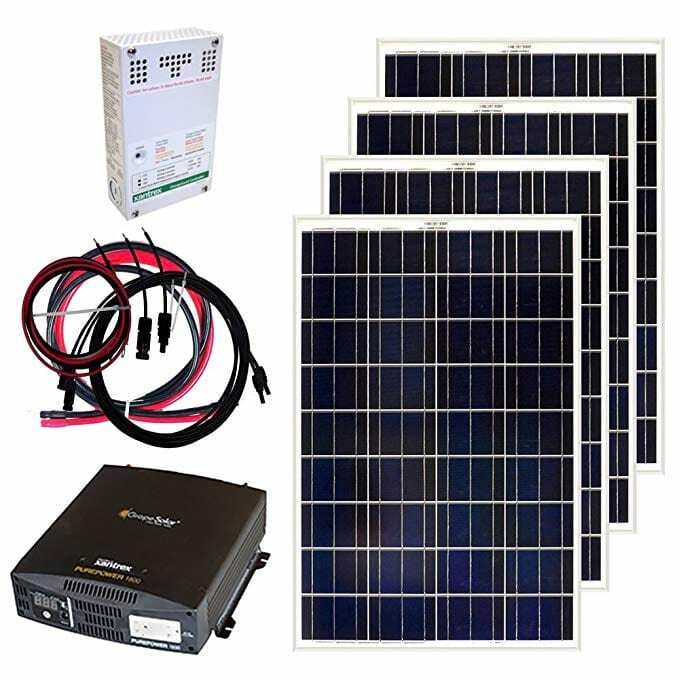 All of the solar panel kits above include, at the very least, everything you need to connect your solar panel to your charge controller, including solar panels, charge controller, and wiring from solar panels to charge controller. 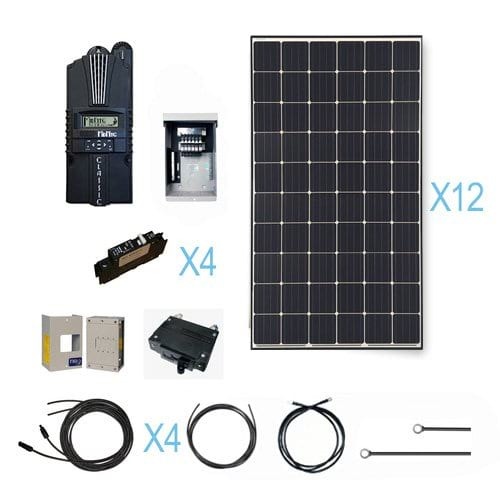 Many kits also include mounting hardware, to connect your solar panels to the roof, wiring from charge controller to battery, and fuses for wiring between charge controller and battery. Most kits do not include inverters or batteries, but we’ve specified if they do. To read more about the equipment above, and what you need to get your kit running, keep reading. Solar panel kits for homes are the biggest kits available and can range from 1,000 watts to 10,000 or more. Most solar panel kits for homes are still for off-grid systems, but grid-tied kits exist and we’ve included one below. Let’s take a look at two good options. Selling Point: Renogy’s off-grid solar kits are cost-effective and include equipment from well-known manufacturer MidNite Solar, includes an MPPT controller that can handle lithium-ion batteries. As we’ve mentioned before, Renogy is one of the biggest names in solar equipment for off-grid installations. They produce everything from solar panels to batteries to charge controllers and inverters. They’ve also put together one of the most legitimate large solar panel kits on the market. The kit is designed for large off-grid systems for cabins and the like. It’s also the only kit on our list that includes an MPPT charge controller, which allows for more efficient electricity generation and lithium-ion batteries as well! You’re also able to remotely monitor the charge controller. Depending on the size of the kit you choose, you’ll need a 12 volt, 24 volt, or 48 volt battery setup to go along with your solar panels. The kit also does not include an inverter or solar panel mounting equipment, so be sure to budget those in when planning your installation. Even with these omissions however, Renogy’s large off-grid solar panel kits are still a pretty good value when looking at $/watt cost, especially as you go up in size. MidNite Solar is a big name in the off-grid solar industry, manufacturing combiner boxes, enclosures, and their ever-popular MidNite Classic charge controllers. With equipment from MidNite and the customer service of Renogy, you’re sure to be in good hands. Bottom Line: Renogy’s large solar kits are cost-effective option if you want to install your own off-grid solar kit. They come with Renogy’s excellent reputation for quality and customer service and include excellent components from well-known manufacturer Midnite Solar. You still have to buy the batteries and mounting hardware, but these kits are a great building block to start from. Selling Point: An all-in-one grid-tied solar installation, SolarEdge inverter and power optimizers, decent price. If you’re looking for a large solar panel kit for your grid-tied home, Grape Solar’s 5,830-watt kit is just about perfect. While you can find Grape Solar kits on Amazon, Costco offers the lowest price by far, so start there. Grape Solar’s 265 watt panels are comparable to other standard solar panels, with a 10 year product warranty and guarantee that the solar panels will produce 80% of their nameplate rating (ie 265 watts) in Year 25 of their production. Where this kit really shines, though is with the inverter they include, a SolarEdge with power optimizers. Unlike other inverters that treat the entire solar installation as one big solar panel, SolarEdge’s system includes small power optimizers that optimize each solar panel individually for max production. In essence, SolarEdge’s inverter system squeezes each drop of production it can from your solar installation, ensuring you are seeing the biggest financial return possible. If you’re looking to purchase a grid-tied solar panel kit, this is a pretty good option, but you need to work out costs to make sure it’s worthwhile. At $10,000, the cost breaks down to $1.72 per watt. If you’re going to install the kit yourself, you’ll certainly save money over hiring an installer. However, if you’re looking to hire a company to install your kit, you’ll need to make your selection carefully. The National Renewable Energy Lab’s 2018 Solar Cost Benchmark calculates solar installations with power optimizers should cost about $2.58 per watt to install, with $1.26 per watt going to equipment costs. Compare this cost to Grape Solar’s $1.72 per watt and you’ll see the premium you’re paying by purchasing a kit through a secondary vendor, not equipment directly from the manufacturer. If your installer is able to keep installation costs low, you might come out ahead financially by purchasing a kit yourself, but our advice is to talk to a handful of small, local installers before you buy the system. Describe the kit, what’s included, what’s required from them, and hear their cost estimates. It might make financial sense, it might not. Bottom Line: If you’re planning to install the system yourself, the Grape Solar Grid-Tied Kit can save you quite a bit of money over hiring an installer. However, if you’re hoping to save money by purchasing the kit yourself and hiring an installer to put it on your roof, you’ll probably come out ahead financially by simply taking advantage of your installer’s ability to buy equipment in bulk at lower costs. Let’s now move on to solar panel kits for RVs. For camper vans, we limited ourselves to 100 watts or below. RVs typically have much bigger electricity needs than camper vans, so let’s take a look at solar panel kits between 200 and 400 watts. Selling Point: Efficient, monocrystalline solar panels in a simple, cost-effective kit. Eco-Worthy’s 200 watt solar panel kit is the perfect option for someone looking for a simple, cost-competitive solar kit for a small to medium-sized RV. 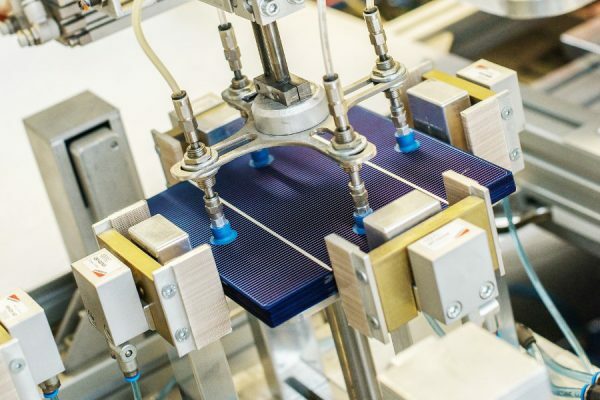 The kit includes two monocrystalline solar panels, a 20 amp charge controller, mounting hardware, wiring to connect the solar panels to the controller, and two adapters to combine the two panels into a single wire. Two hundred watts probably isn’t enough if you’ve got a larger RV or your energy use is high, but for smaller rigs it’ll do just fine. If you do want to go up in size, the 20 amp controller can handle a total of 300 watts in 12 volt mode, so that’s certainly an option down the road. Unlike the cheapest controllers, this one has an LCD screen to tell you your system’s voltage, battery charge, and energy production status, as well as two USB ports to charge your smartphone or iPad without an inverter, a thoughtful feature that could come in handy in a pinch. You’ll need to buy a battery and inverter, as well as the additional wiring, and since the controller is a PWM controller, you’re limited to lead-acid batteries, as PWM controllers can’t handle lithium-ion. Still, at the kit’s low cost it’s not a bad deal. Unfortunately, there aren’t enough reviews of the kit to be helpful, but what’s there is good and Eco-Worthy’s other products are well-reviewed, so we don’t think there’s anything to really worry about. The only issue any reviewer mentioned is that the kit doesn’t include instructions, though they did say installation was quite easy. It’s certainly an annoyance, but in our minds not a deal breaker at this price. 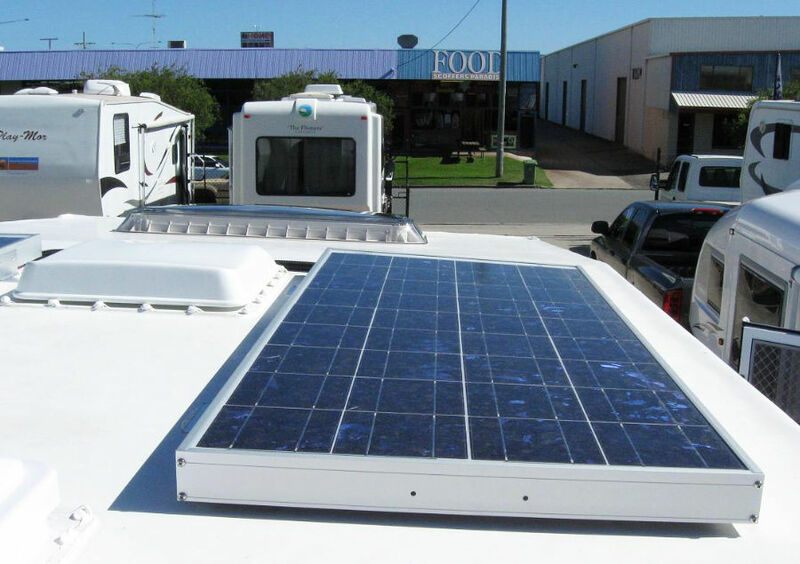 Bottom Line: Eco-Worthy’s 200 W Solar Panel Kit is a great deal for small RVs. 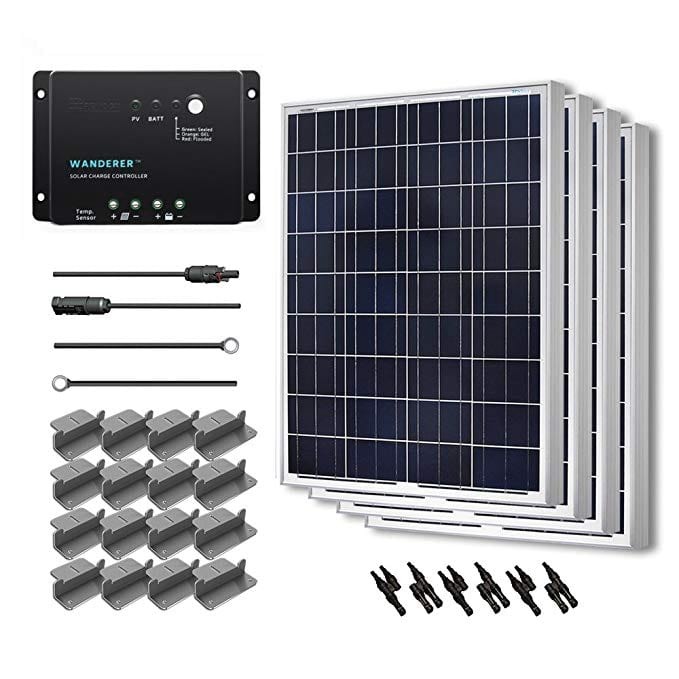 For the same price you could buy two solar panels individually, you’re also getting mounting hardware, wiring, adapters, and a charge controller. It’s a simple kit that should be very easy to install in your RV, especially if you’ve already got an inverter and battery in place – just make sure that battery is lead-acid, not lithium! Selling Point: Like the Eco-Worthy kit above, Renogy’s 400 W Solar Starter Kit is easy to install and easy on the pocketbook. Renogy is the biggest name in small-scale solar for RVs, campers, boats, and cabins. Their 400 watt Solar Starter Kit is a great option if you’re looking for a larger solar solution for your RV. With four 100 watt panels and the hardware to attach each one individually to your roof, you can play Tetris up there to fit all of them. 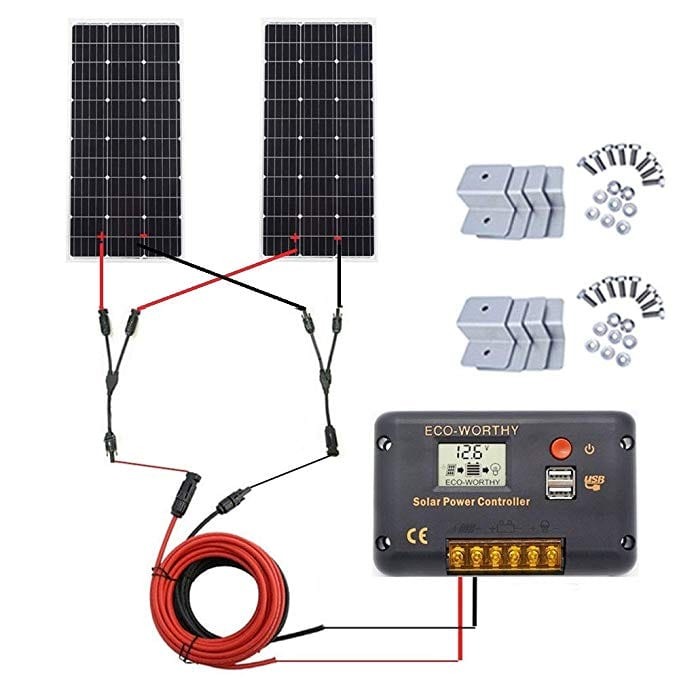 The kit also comes with Renogy’s Wanderer 30 amp charge controller, wiring (solar panel to controller and controller to battery) and MC4 branch connectors (for your solar panels). The 30 amp Wanderer is a PWM controller, so as such it’s not safe to use with lithium-ion batteries. If you’ve already got a lithium battery, or plan on buying one, upgrade your Wanderer to Renogy’s 40 amp Rover MPPT controller for a couple hundred bucks more. Buyers continually give this Renogy kit excellent reviews, noting each component is high-quality and the kit is very easy to install. The only real downside that numerous users noted is that, unless you have all your panels installed in a row, the wires aren’t long enough to reach all of them. If this could be your case, you’ll have to buy an extension cable or two. Bottom Line: There’s not too much to say on this solar panel kit. It’s affordable, comes with high-quality components, and customers love it. If you’re looking for a larger solar kit for your RV, you can’t go wrong with this one. If you want a lithium-ion battery though, you’ll have to upgrade to the much more expensive MPPT controller. Solar panel kits for sheds aren’t necessarily larger than RV kits, but since the kits aren’t designed for use in a cramped RV, size and weight isn’t as much of an issue. As such, kits in this category can include larger inverters, larger charge controllers, and wall-mounted combiner boxes that are simply too big and awkward for RVs. One of the kits below also doesn’t include mounting equipment. As opposed to the cheap, simple brackets we all use to attach solar panels to RVs, solar panels for sheds or cabins can both roof- and ground-mounted, so many larger solar panel kits simply don’t include mounting hardware. Make sure you know what’s included before purchasing! Selling Point: A quality mid-sized system with a pure sine wave inverter and excellent customer service. Grape Solar’s 400 watt Solar Panel Kit is the perfect solution for a shed or small cabin. It comes with four 100 watt panels, an 1800 watt pure sine wave inverter, a 35 amp charge controller, and the wires to connect the solar panels to the charger and the controller to the battery. The only thing you need to bring is the battery, which must be 12 volts, and the mounting hardware. The 35 amp charger controller is large enough to safely add one more 100 watt panel, for a grand total of 500 watts. However, like the other controllers above, it’s a PWM controller, not an MPPT, so you can’t add a lithium battery, only lead-acid. However, PWM controllers are cheaper, so there’s certainly a balance of performance and cost going on. The included inverter is also a good piece of equipment. At 1800 watts, the inverter that comes with the kit is large enough to charge all your gadgets at the same time. It’s also powerful enough for a blender or hair dryer, but possibly not at the same time as all your gadgets. The inverter includes two 3-prong outlets and a USB outlet. It’s also a pure sine wave inverter, as opposed to a cheaper modified sine waves inverter, which means it can power more sensitive electronics like some CPAP machines, power tools, and some laptops. Grape Solar makes quality solar components and this kit is no different. Many buyers are using it for their off-grid cabins and tiny homes with reliable results. Customer service is bar none, with friendly staff that is actually knowledgeable on the finer points of their technology. Bottom Line: If you’ve got a shed or a small cabin that only needs around 400 watt of solar power, Grape Solar’s kit is the perfect solution. It’s low-priced with quality components. Just don’t forget to buy the battery and mounting hardware. Selling Point: A 24 volt kit at a low price, comes with combiner box, inverter, and charge controller. 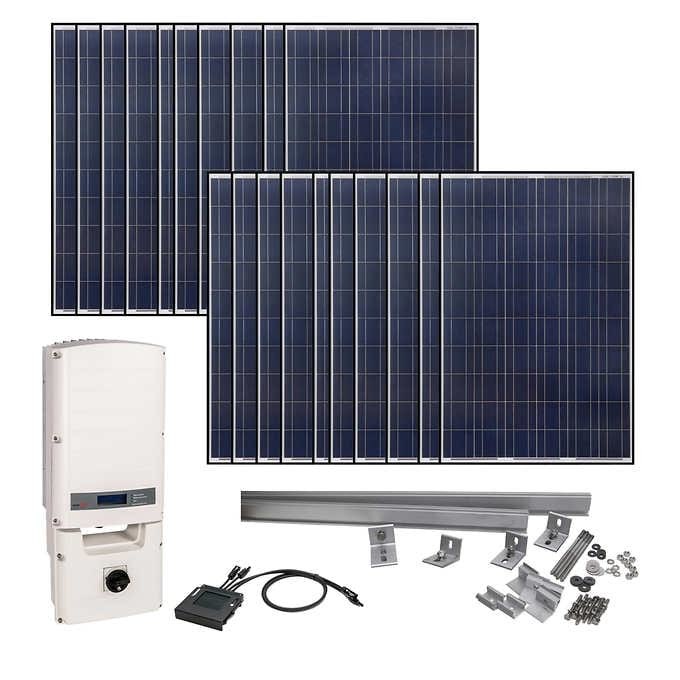 This large 24-volt kit comes eight 100 watt solar panels and mounting hardware, charge controller, inverter, and a locking PV combiner box to combine all the solar panels together and only run a single positive and negative wire to the controller. First off, let’s start with the bad. Customers complain that the directions included with the kit – if Eco-Worthy remembers to send them – are very confusing, so you’ll have to do the research yourself on how and where to install the solar panels. Second, while the product image shows wire to connect the combiner box to the charge controller, numerous customers have reported not receiving it, while other customers do get it. It seems like it’s a coin toss. Lastly, a few customers have noted that the 60 amp charge controller is somewhat flimsy, so best to install it and leave it. Even with those negatives, the Eco-Worthy 800 Watt Solar Panel Kit remains a great choice for sheds or small cabins with fridges or other appliances. It comes in around $500 less than similarly-sized kits and includes a pure sine wave inverter designed for off-grid systems. As opposed to cheaper modified sine wave inverters, pure sine wave inverters can power any and all electrical gadgets – including sensitive appliances like CPAPs and power tools. The inverter itself is designed to convert 24 V DC electricity to 110 V AC and can handle 3,000 watts of continuous power and 6,000-watt spikes (as appliances can use double or even triple their labeled wattage for a split second when turning on). The 6 string combiner box (though you’ll only need four) is also a nice touch that other kits don’t include. Remember also that, as the system is designed for 24 volts, you need to buy at least two 12 volt batteries and connect them in series to reach the required voltage. At this low price point, there are bound to be a few issues, like we’ve mentioned above. But overall, customers dig the product and appreciate the low cost and simplicity of the system. Bottom Line: A low-cost option for a shed or small cabin, but make sure your Eco-Worthy kit includes everything you need! Can I Save Money with a Solar Panel Kit? Installing any equipment yourself usually allows you to enjoy a lower overall cost. Most of the kits above cost about $1.50 to $2 per watt. If you’re looking to install a grid-connected solar system, hiring a solar company to install a solar system on your home costs about $3 per watt, so with a solar panel kit you’re already looking at a 33% to 50% discount. If you’re interested in an off-grid solar installation, hiring a company to install solar in your RV or camper could cost less or more than $3/watt, but we’d bet on more since they’re a smaller installation and most larger home solar companies can offer lower costs by buying equipment in bulk. So yes, installing a small solar panel kit in a cabin, RV, or van yourself is a great way to shave some of the costs of solar. If you’re looking to install solar on your detached shed or garage, installing your own solar panel kit has the potential to save you quite a bit of money, as running electrical lines from your house to a separate structure is usually prohibitively expensive. Instead, you can simply install solar yourself and keep much of that cash in your pocket. So yes, you can save money by installing solar with a kit. However – and here’s the important question – should you install solar with a kit? Let’s answer that question now. Are Solar Panels Kits Easy To Install? All of the small solar power kits that we reviewed above are simple and easy to install. Information abounds online about installation practices, sizing your system and battery, and safety concerns. With a little research and a few hand tools, anyone can safely and competently install these small solar kits. If you’re worried whether you have the skills to install a solar panel kit in your cabin, RV, or campervan, forget about it – you can do it! As you go up in size, say 1,000 watts or more, solar installations become more complicated. Not just in the wiring and electrical components, but also in installation. How do you safely attach a few hundred pounds of solar panels and equipment on your roof? What about sealing the lag bolts from water leaks? Is ice damming a bigger issue with solar panels? You need to be able to answer all these questions and a hundred more when installing solar on your home. If your home is grid-tied, like most homes in the US, you’ve got even more questions to answer. Does your utility allow self-installed solar installations to connect to the grid? (Spoiler: Many do not) Can you provide your local building department the necessary electrical diagrams and structural information? What size electrical conduit do you need to run the wires from your roof to the inverter? 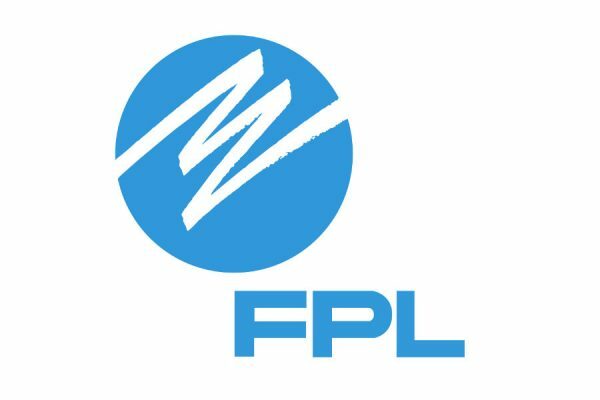 Even after all this, most jurisdictions only allow licensed electricians to actually work in your electrical panel, so you’ll have to hire an electrician to connect your installation to your home’s panel. For most of us ‘regular’ people, it doesn’t make sense to install a large solar installation ourselves. We lack the knowledge and skills to install an entire solar installation safely. Small kits are one thing, but if you want a large, grid-tied solar system on your roof, it’s probably better to simply hire an installer. Almost all solar panel kits are designed for off-grid use. In other words, the kit will never connect to the utility infrastructure – it’s completely independent. Good examples of off-grid installations include solar in RVs and camper vans, backyard sheds (if not connected to the home’s electricity), and off-grid mountain cabins. Choosing between an off-grid and grid-connected system is usually pretty easy, as your situation dictates your needs. If you’re wanting to add solar to your grid-connected home, you’ll need a solar panel kit designed for grid use. If you’re adding solar to your RV or far-away mountain cabin, you’ll want a solar panel kit designed for off-grid use. What Do Solar Panel Kits Include? Charge controller (for off-grid systems), which goes between the solar panels and battery, to protect the battery from over- and undercharging. Take a look at the kits you’re interested in to see what’s included. If it doesn’t include any of the above, you’ll have to buy them separately, which isn’t a huge deal, since multiple options for each piece of equipment above can easily be found on Amazon. If you’re looking to install an off-grid solar installation, you’ll have to buy a battery separately, as none of the kits above comes with one. To help you with your installation, your kit usually includes a manual that describes the installation process, as well as what equipment you’ll need to complete your installation and even recommendations on battery type and size. Like we mentioned before, small solar panel kits are great for RVs and sheds, but if you want to run your entire home on the sun, hiring an installer is still the best option. Costs are falling each year, and by hiring an installer, you have the knowledge that your system is installed safely and lawfully. Check out some of the best solar panels and best solar installation companies if you want to get a full-sized solar system for your house. Of course, not all installers offer great service, so do your research and get estimates from a few different companies to compare costs and customer experience. Estimates are always free and the best companies aren’t pushy at all. The financial savings of installing solar typically sells itself, and the best installers know that no pushy sales tactics are required. Until you’re ready to go full-on solar, solar panel kits are an easy way to get your RV or cabin running on clean, renewable energy, so get on it!